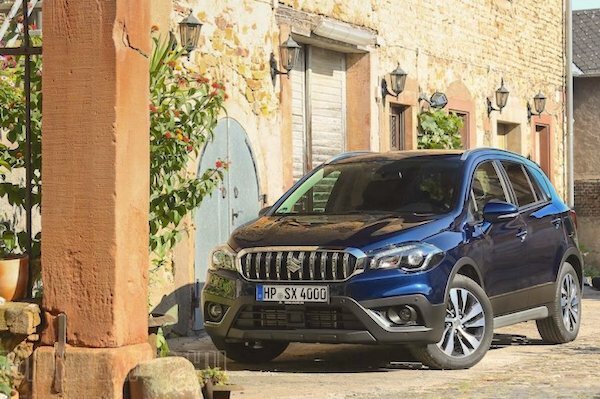 The Suzuki SX4 S-Cross ranks 3rd in Hungary in January. The Hungarian new car market starts 2018 with a bang: up 38.5% year-on-year in January to 8.891 registrations. Brands leader Suzuki does vastly better, improving by a stellar 118% on its January 2017 score to snap 14.4% of the market vs. 13% over the FY2017. Skoda also outpaces the market at +57% to 10.3% share vs. 9.1% in 2017. #1 a year ago, Ford is up “just” 22% to fall to #3 overall, distancing Toyota (+55%), Volkswagen (+31%) and Opel (+34%). Dacia (+6%) and Kia (+18%) under-perform while Mercedes and Nissan break into the Top 10. The Suzuki Vitara, #1 in 2016 and 2017, remains the best-seller in Hungary with sales up 59% to 8.1% share above the Skoda Octavia (+49%) with the Suzuki SX4 S-Cross rounding up the podium. Outstanding performances of the Ford Kuga at #4 (+60%), the VW Jetta in runout mode at #5 vs. #35 in FY2017, the Toyota Auris at #8 vs. #35 in FY2017 and the Toyota C-HR at #9 vs. #26 in FY2017. Full January 2018 Top 10 brands and Top 30 models rankings below.